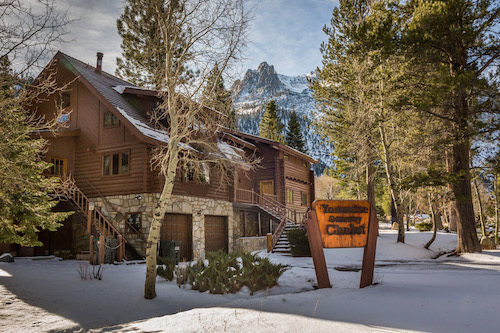 The Yosemite Gateway Chalet is 45 minutes from Yosemite National Park and is within a mile of fine dining, spa facilities, and quality downhill skiing. Lodging: Three individual rooms (with private bathrooms) in a giant log cabin; excellent kitchen; large oak bar. Fully furnished. SLEEPS 8 ONLY. Features: WiFi, fully equipped kitchen, hiking trails, world class climbing and ice climbing nearby, outdoor hydrotherapy tub for six, indoor jacuzzi for two. Skiing: One mile to June Mountain. Experienced backcountry skiers can ski from the top of the mountain to the cabin’s hydrotherapy pool. Convenient: A one hour flight from LAX, San Francisco, and San Jose from December to April; a five-hour drive time from Los Angeles; under six hours from the Bay Area. Car rental services are available in Mammoth. Near Yosemite: Only 5.75 miles away as the crow flies. Address: 4835 Highway 158. We're between Fern Creek and the Carson Peak Inn.